Dance • New documentary captures the groundbreaking history of Salt Lake City dance company. 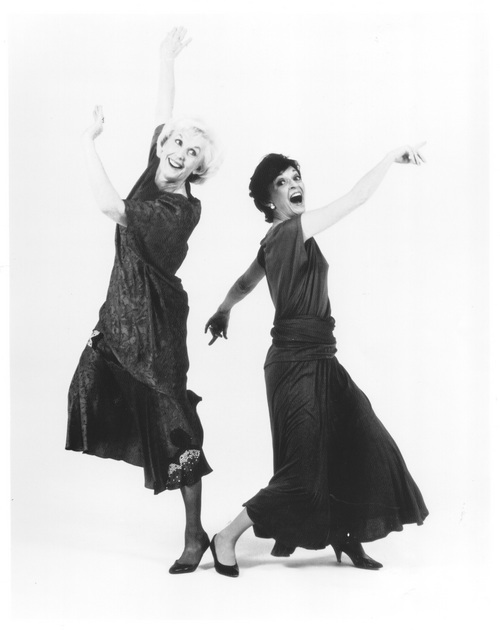 Courtesy photo Joan Woodbury and Shirlie Ririe at a photo shoot in the early 1970s. Courtesy photo "Crucible," a dance choreographed by Alwin Nikolais, as performed by Ririe-Woodbury dancers in the mid-2000s. A new film detailing the groundbreaking history of Salt Lake City&apos;s Ririe-Woodbury Dance Company weaves together beautiful clips of contemporary works. But the spine of Claudia Sisemore&apos;s 54-minute documentary offers a peek into the longtime friendship of company founders Shirley Ririe, 84, and Joan Woodbury, 86, who apparently found the fountain of youth through their love of dance  and arts activism. "To me, they are to dance what [Maurice] Abravanel was to music," says the filmmaker, who has also made a film about the conductor whose name graces Salt Lake City&apos;s symphony hall. Sisemore began filming the dance company in the late 1990s, and then began working specifically on a film documenting its history in 2004. The documentary gracefully weaves together dance clips with interviews, but also includes plenty of scenes of Woodbury, Ririe and former artistic director Charlotte Boye-Christensen sitting on the floor and making notes in rehearsal. "One of the most remarkable things was seeing how well Joan and Shirley work together after so many years," Sisemore says. "They have such respect for each other. Things run smoothly because those two get along so well." "The Ririe-Woodbury Dance Company" documentary will receive its first public screening on Wednesday, Aug. 6, at the Rose Wagner Performing Arts Center. Reservations are required (see box) for the free screening. The R-W film serves as a companion to an earlier Sisemore film about Repertory Dance Theatre, the city&apos;s other longtime dance company. And the pair of dance films join Sisemore&apos;s library of documentaries about other artists  including Abravanel, dance teacher Virginia Tanner and painters LeConte Stewart, Lee Deffebach, Randall Lake and Ted Wassmer  which together serve to preserve multiple chapters in Utah&apos;s arts history. Now, the filmmaker hopes to find grant funding to make her videos available to local schools, universities and museums, along with curriculum to help teachers use them in lessons. Sisemore&apos;s body of work serves as a background to the story of a company entering its 51st year, yet many locals still mispronounce its name or confuse the group with RDT. The documentary focuses on the company founders, Ririe, a native of Salt Lake City, and Woodbury of Cedar City, who met in 1962, thanks to a shared mentor at the University of Utah. Ririe, then teaching at Brigham Young University, went on to job share with Woodbury at the U. The women even teamed up while planning their families (Ririe is the mother of four children, while Woodbury has three), getting pregnant in alternating years. For a while, the pair danced and created dances as part of a company named Choreodancers, then launched Ririe-Woodbury in 1964. Naming the company after themselves was a recommendation from another shared mentor, dance pioneer Alwin Nikolais. At the pair&apos;s invitation, for six summers Nikolais taught summer workshops at the U., creating a vocabulary on local dance students that later became part of his pioneering multimedia works. After Nikolais&apos; death in 1993, Ririe-Woodbury became the only professional company in the world licensed to perform a full evening of his work. As the film documents Ririe-Woodbury&apos;s history, it also notes the founders&apos; roles as national innovators. In 1955, Woodbury was selected as the first Fullbright scholar in dance, traveling to Berlin to work with choreographer Mary Wigman. (Also notable: Woodbury was eight months pregnant at the time.) In the late 1960s, Ririe was one of four artists selected to pilot an initiative that later became the artists-in-the-schools program funded by the National Endowment for the Arts. From 1972 to 1980, R-W received generous NEA grants to teach residencies in schools across the country. "We loved Lima, Ohio," Woodbury remembers. "We went back four times." The program required matching funds from school, state and NEA budgets; as a sign of their support, schools were required to build a raised floor for workshops and dance performances. "We were ambassadors, really," Woodbury says, specifically ambassadors for Utah and the art form of dance. "One year, we toured 40 weeks of the year, which gave us the opportunity to hire full-time dancers. When the program stopped, we had our own model for what we wanted to do. And we kept that up here." In addition to an interview with Boye-Christensen, the film introduces new leader Daniel Charon and provides perspective from Woodbury&apos;s daughter, Jena, now the company&apos;s managing director. Woodbury hopes the film will offer viewers a sense of how the company has evolved, as well as the cultural context for a dance company that happens to be based in Salt Lake City. "I hope they get some insight on what things are possible here," she says. The new documentary "The Ririe-Woodbury Dance Company: A Claudia Sisemore Film" will be screened. When • Wednesday, Aug. 6, at 7 p.m. Season tickets • The company&apos;s season of performances will begin Sept. 25-27. Season tickets are $75, available at 801-297-4241.